Part 1 Identifying and controlling hazards on the farm and feedlot: Biological pathogens in animals; Detecting pathogens in cattle and meat; Detecting animal tissues in feed and feed ingredients; Plant and fungal toxins as contaminants of feed and meat; Detecting veterinary drug residues in feed and cattle; Environmental contaminants and pesticides in animal feed and meat; Controlling microbial contamination on the farm: An overview; The use of diet to control pathogens in animals; Probiotics, vaccines and other interventions for pathogen control in animals; Managing pathogen contamination on the farm. Part 2 Identifying and controlling hazards during and after slaughter: Sources of microbial contamination at slaughtering plants; Animal welfare and food safety at the slaughter plant; Slaughter and fabrication/boning processes and procedures; Removal and handling of BSE specified risk material; Removal of the spinal column from carcasses; Physical decontamination strategies for meat; Chemical decontamination strategies for meat; Carcass chilling; Emerging decontamination techniques for meat; Irradiation of fresh meat; Combining physical and chemical decontamination interventions for meat; Fresh meat spoilage and modified atmosphere packaging; Meat safety, refrigerated storage and transport: Modelling and management; Meat decontamination and pathogen stress adaptation; Molecular typing methods for tracking pathogens; The role of quantitative risk assessment in assessing and managing risks related to microbial food pathogens; HACCP in the processing of fresh meat; Microbiological performance objectives and criteria; HACCP in slaughter operations. Monitoring, validating and verifying the effectiveness of HACCP systems. The safety of fresh meat continues to be a major concern for consumers. As a result, there has been a wealth of research on identifying and controlling hazards at all stages in the supply chain. Improving the safety of fresh meat reviews this research and its implications for the meat industry. Part one discusses identifying and managing hazards on the farm. There are chapters on the prevalence and detection of pathogens, chemical and other contaminants. A number of chapters discuss ways of controlling such hazards in the farm environment. The second part of the book reviews the identification and control of hazards during and after slaughter. There are chapters both on contamination risks and how they can best be managed. The range of decontamination techniques available to meat processors as well as such areas as packaging and storage are examined. 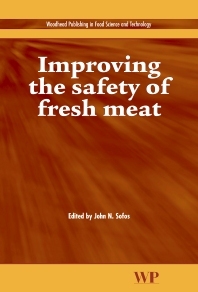 With its distinguished editor and international team of contributors, Improving the safety of fresh meat is a standard reference for the meat industry. A standard reference for the meat industry. John N. Sofos is Professor of Meat Microbiology at Colorado State University and a well-known authority on meat safety.